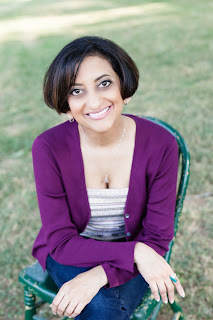 Two Chicks On Books: Cover Reveal- SOULMATED by Shaila Patel Chapter 1 Reveal & A Giveaway! Cover Reveal- SOULMATED by Shaila Patel Chapter 1 Reveal & A Giveaway! When people find out that I've written a book, invariably the first question is, "Where did you get the idea for the story?" If I had a quick and easy answer like, "I checked www.BookIdeas.com," my phone calls with the family would be so much shorter! Anyway, the truth is a bit more complicated—much like my family's recipe for the perfect cup of chai. After years of writing literary short stories, I thought I'd try my hand at a paranormal romance. Perfectly normal leap of logic, right? (I have Twilight to thank for that!) For whatever reason, I'd been thinking of how emotionally perceptive my mom was and that if there were such a thing as an EQ test (where the E stands for emotional intelligence), my mom would score through the roof. She just always had this uncanny ability to read my feelings. I'd never seen a story about empaths—people who could read emotions like psychics could read thoughts—but the idea grabbed on and wouldn't let go. And that, my friends, was the beginning. 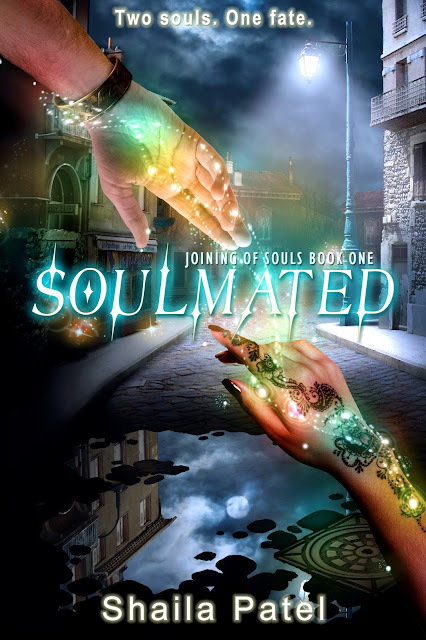 Soulmated is finally ready to be released, and I hope you all enjoy it as much as I had fun writing it! They're calling this a test? Not even a ping grazed my mind as the five Elders tried to slip past my mental blocks and into my emotions. A sheen of sweat over William's lip proved he wasn't faring as well. Of all the cousins now come of age, William and I were the last to be sitting before the Elders. I'd have felt guilty for his not doing so well had he ever shown an interest in leading the family. But, we all knew he'd rather have his head in a library. Now his heart was with his wife Colleen. He at least seemed to have a choice about his fate. "Are we boring you, Prince Liam?" I snapped my eyes up to Elder Adebayo. He wore his trademark bow tie with a traditional fila atop his head. In the fraction of a second it took me to untangle the meaning from his heavy Nigerian accent, I'd blanked my expression and sat upright. The Elders sat along one side of an antique conference table, facing William and myself. The manor staff had rearranged the study to hold both the testing and signing-over ceremonies. Gone were the leather club chairs and stained glass lamps normally dotting the large space, giving it the air of a posh library. Now it seemed more an election-night headquarters, like the sort you saw on the telly, with bright lights and a gathering of family strewn about, waiting for the results. A photographer hung out in one corner, camera in hand. Not far from him stood a team of solicitors guarding rolling briefcases that were no doubt stuffed with legal documents for the victor to sign. My throat-clearing echoed in the now silent room, and my cheeks warmed. "No, sir, not at all. Although, uh … I'd like to know when it is you'll begin with me." I pasted on an oh-so-innocent smirk and watched William shake his head and smother a grin. I shrugged at him, hoping to lighten the mood. The familiar knocking on my brain—like the distant sound of drums—told me someone had got past my first line of defenses with their probe. The rest of my mental blocks held up though. The corner of Brennan's lip stretched upward. Toying with me, was she? I leaned back with a matching smile and loosened my tie. Mum and I were the only ones in the family who'd mastered the skill of probing and manipulation. A handy skill that, especially when the burden of the entire clan's financial success might well be resting on my shoulders. As if sensing the end of the ritual, Mum whispered to the house staff and pointed toward the main doors, directing them to begin preparations, most likely. She turned and nearly ran into a Mediterranean-looking man with a grotesque mole on his left cheek. He wasn't a relation or a solicitor, so I assumed he was a council minister. Their stances were stiff, and despite being too far for me to hear, I sensed Mum's replies seemed short and clipped. He moved around her, and on his way out, his eyes met mine. He lifted his lips in a smirk. Jaysus Christ. Thank you. This bleedin' muck-up was about done. After tallying the results, she stood with the help of a finely carved cane. Rumors about her age had always been entertaining—the last one I'd heard was that Claire Brennan was well over 140 years old. Apparently, documents as to her history had disappeared. Her regal manner and piercing blue eyes—the sort that'd make a gutless gobshite piss his pants—set her apart from the rest of the Elders. She now set those sights on me. sixth of June, in the year 2015." Flashes from the camera punctuated every other word, and spots began to form in front of my eyes. "You have proven your worth to lead your clan by exhibiting the strength of your empath skills to the satisfaction of the presiding group and by extension, the Council of Ministers." Mum hurried over with open arms. "Darling! We're so happy for you." Da and my older brother Ciarán, a non-empath, followed, both decked out in a suit and tie. After her hug and kiss and Da's pat on my back, they congratulated William on his effort and made room for the Elders to come around with their well-wishing. Ciarán smirked and punched my shoulder. The strobe-light effect of the flashes had me squinting. Elder Santiago from Spain shook my hand. He sported a thick mustache and proudly wore his Catalonian flag pin on his lapel. He'd been wooing our clan for support in Catalonia's bid for secession from Spain. Ciarán had thought it a good cause to be getting behind—especially if we beat another royal clan from doing so first. We had several holdings in Barcelona, after all. Now that it was my call to be making, a hasty decision didn't seem wise. Santiago always had the look about him of a tapas dish drowning in olive oil. He sidled closer. "Your strength is most impressive. And at the age of eighteen too. It is not hard to believe you will be the next soulmated empath, in truth. Some have doubts though, eh?" Da pointed to his own temple, stabbing at an unruly black curl. "No need for doubts. If I've seen it, it's as good as true." I resisted rolling my eyes. Admitting I had my own doubts about Da's visions wouldn't be wise. "Time will tell, yeah?" No point kissing Elder arse. I leaned in. "So were you toying with me earlier?" My bold question would either be living up to the liberties given to the heads of the four remaining Irish royal houses, or it'd be taken as the yipping of a whelp learning to growl. I hoped for the former and straightened up just in case. "The test need only be as strong as the weakest candidate." She curved her gloved hand around the crook of my elbow and turned me to face the patio. "Come now. Walk me outside." Leading an Elder outside for a private conversation wasn't as nerve-racking as I'd thought. With her hand resting on my arm, she exuded an unexpected grandmotherly warmth. The stone patio ran the length of the building on this side of our manor home. It overlooked the meadows of our property—now mine—and with the cloudless days we'd had of late, the scent of heated earth surrounded us. I inhaled deeply. Definitely better here than returning to the States. Her gaze floated over the view. "It seems you are to have a very interesting future ahead of you." Her features relaxed with another one of her enigmatic smiles. "When will you be returning to America?" "I'm thinking to stay here," I said. How the hell was this any of her bloody business? I forced my expression to remain neutral and unclenched the hands I'd not realized I'd fisted. If only Da had kept his mouth shut over the years. "Choices are a funny thing, Prince Liam. We often treat them as black and white, but rarely are they." A breeze picked up and coaxed a few strands of her silver hair across her cheek. She tilted her face into the wind and closed her eyes. "You should return to your search." She turned and pinned me with a stare. "What? Why? Are you trying to boot me from Ireland? Away from the estate? Is something happening you're hiding from me?" She held up her hand. "The demesne will be in capable hands. Go now. Enjoy your celebration. Congratulations and happy eighteenth birthday." With a nod, she summoned two of her gendarmes, who came to her side and escorted her down the patio. Mum must have been watching because she rushed outside. "What did she want?" Her concerned gaze scanned my face as if to get a read on my emotions, but as usual, I had them blocked. I rolled my shoulders and took a breath. "She wants us to go back to the States." I knew that look. "Just say it, Mum." "Your father had another vision during the night." I snorted. "Where now? Alaska?" "Liam, you used to believe—"
"Do you think we'll be seeing some actual igloos? We could even go to the North Pole and watch the ice cap melt—"
"What harm could one more year—?" "Have you tried whale blubber, Mum? I hear it's a right treat." An elderly couple came out onto the patio. With a huff, Mum crossed her arms and broadcast her emotions as clearly as any mother's scowl would convey. Waves of her irritation registered in my mind like seaweed washing in and wrapping around my toes. I moved a few steps away and leaned over the balustrade, resting my forearms on the sunbaked stone. A good fifty yards out, a hare popped up to scan its surroundings and then chased a second one into the shrubbery. After a few moments, Mum joined me. "We know this isn't easy, Liam, but we're doing it for you. We've sacrificed so much. Please understand." I ground my back teeth and straightened. So much for making it happen my way. "Fine. One more year." If the Elders knew about our search, so did the rest of the empath community. Speculation would be flowing like whiskey tonight, but it didn't change the fact we'd not be finding our target in Ireland. Super excited to try and win this!! Soulmated sounds great! A creative take on forbidden love.